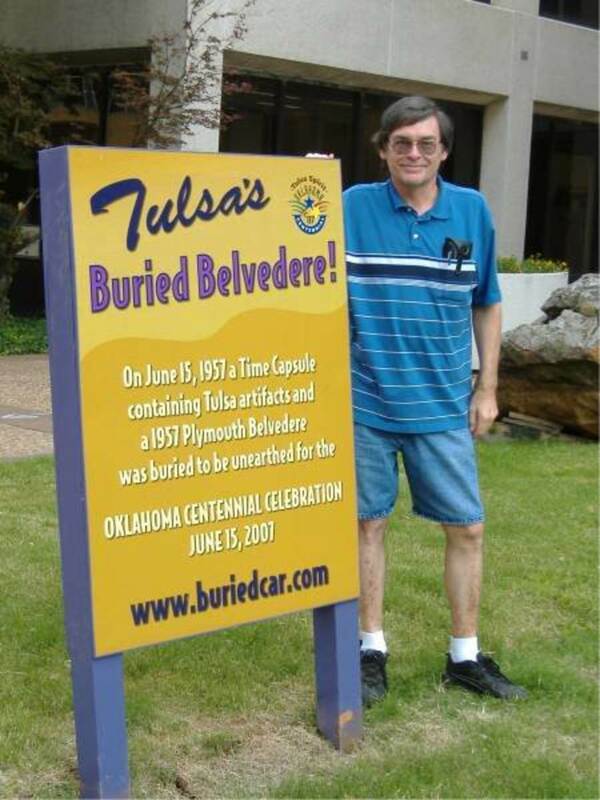 Whatever Happened to Miss Belvedere, Tulsa's Ruined Classic Car? 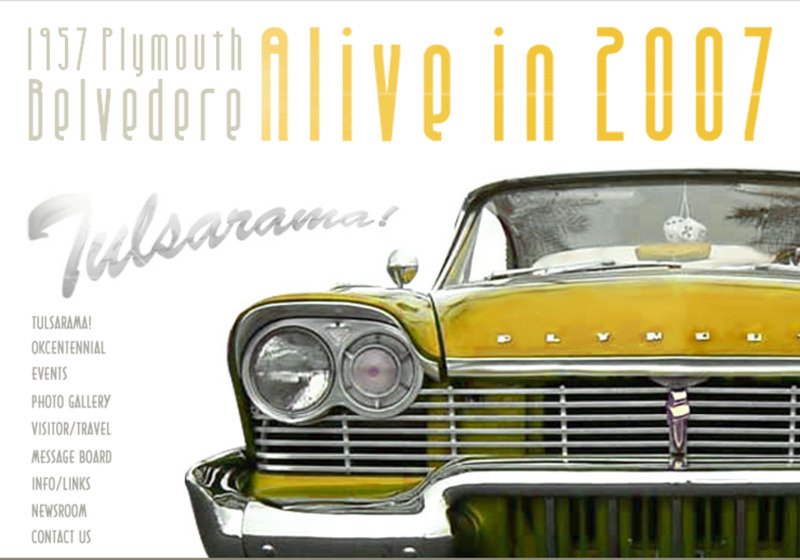 Imagine winning a free, all original, 1957 Plymouth Belvedere classic car with only 4 miles on the odometer that is interwoven with the local culture and heritage. Sounds amazing right? 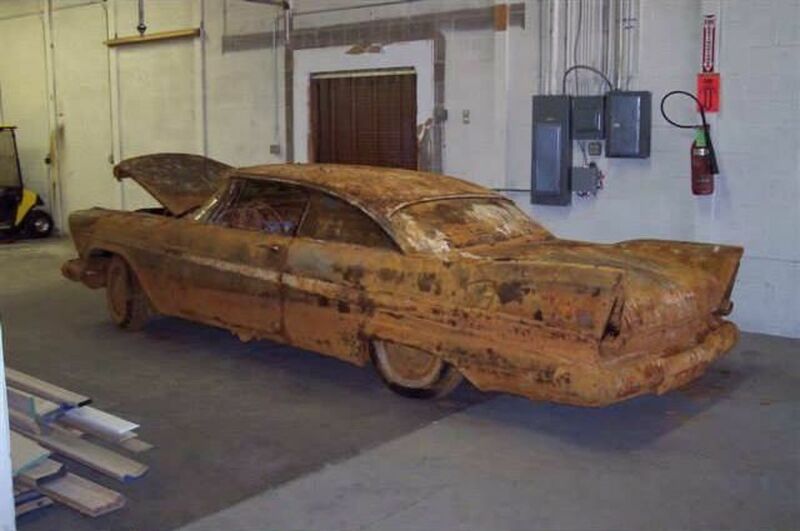 Ok here's the catch, the car doesn't run, is held together only by rust and mud, and has spent the last 50 years buried in a waterlogged concrete vault. Still interested? If so, than Miss Belvedere is the car for you! This is what Miss Belvedere should have looked like. 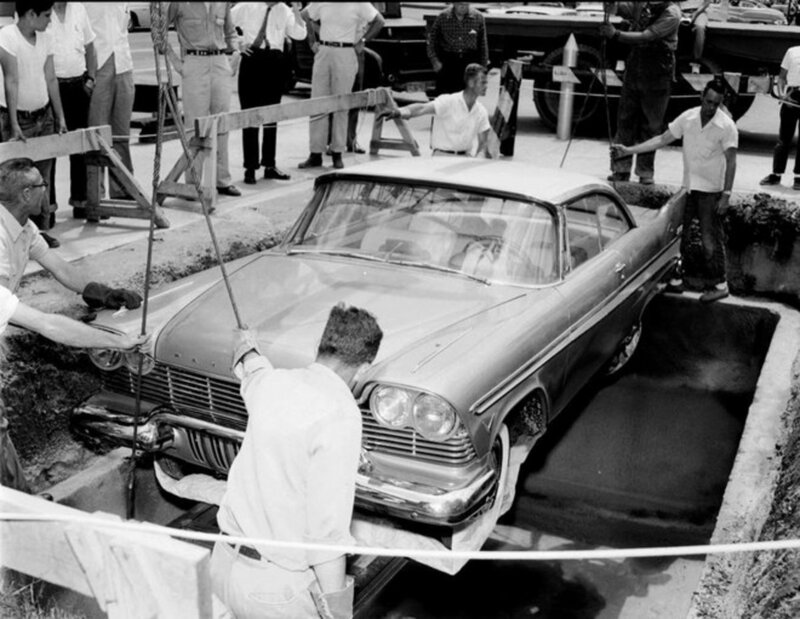 So why exactly did the City of Tulsa bury a brand new car in 1957? Simple. 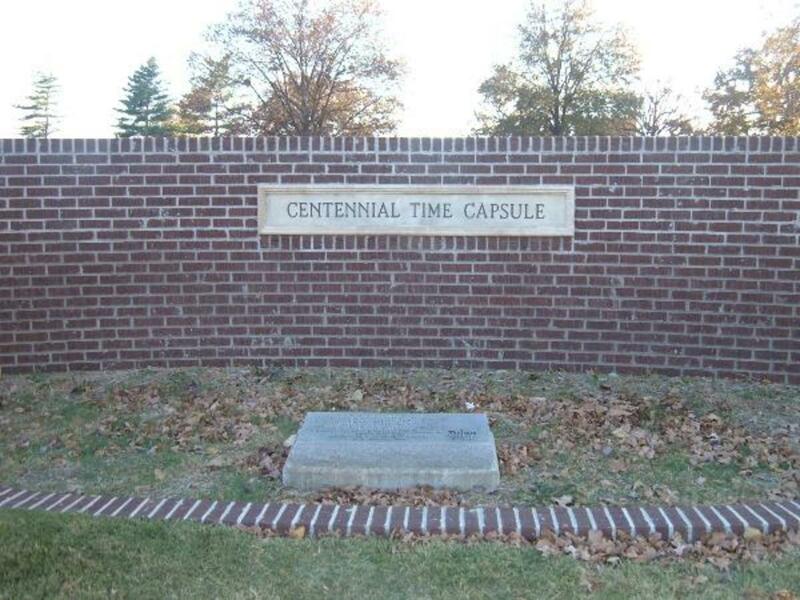 It was a time capsule! A novel idea actually. 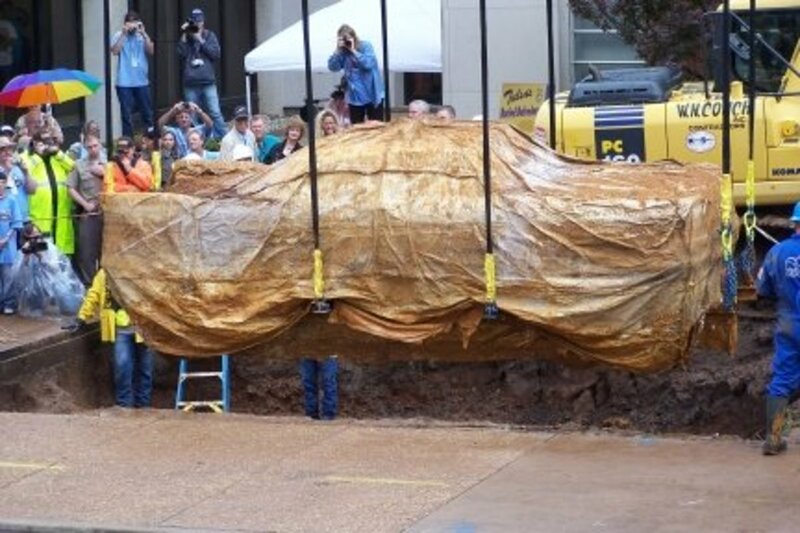 To commemorate Oklahoma's 50th anniversary of statehood, the City of Tulsa chose to bury a brand new gold and white 1957 Plymouth Belvedere in a vault beneath the lawn of the city courthouse. 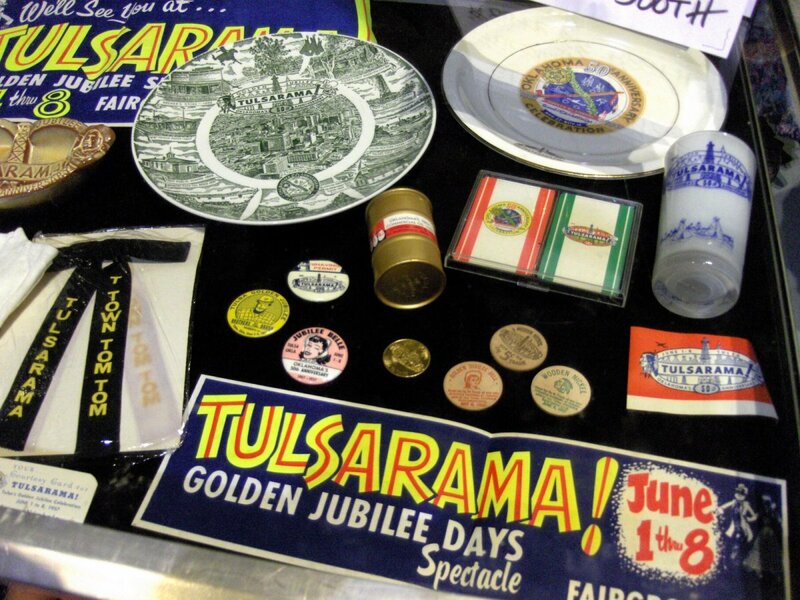 Not only was the car a time capsule; its trunk packed with relics and keepsakes from the state's cultured past; but it was also a prize. All the lucky individual had to do was accurately guess what the city's population would be in 2007 to win the car! 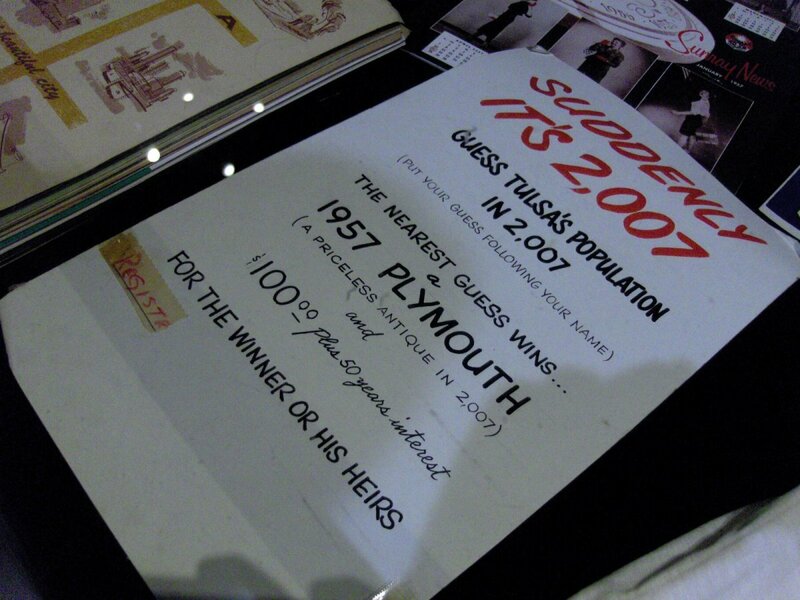 812 people entered the long term contest, their answers copied onto a microfilm and stuffed into the glovebox of the car. 10-year-old Sharon Davis stood in the crowd of onlookers watching Miss Belvedere into the ground. She couldn't have been more excited as she would still be alive 50 years later for the car's unearthing. Miss Belvedere in the 1957 during the ceremony that would entomb her. "Suddenly It's 2007" reads the sign beside the car. 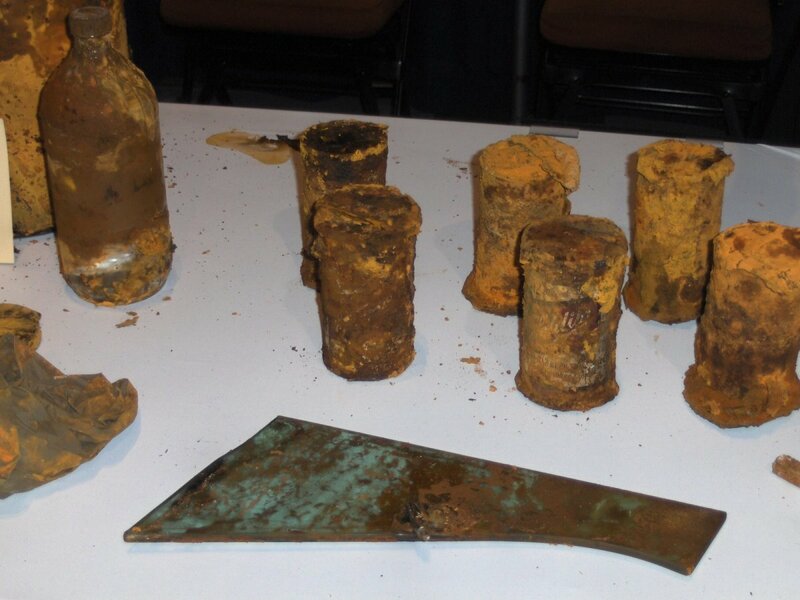 Burial commences on Miss Belvedere and her treasure trove of artifacts. Lowering the time capsule behind Miss Belvedere. The contents of a women's purse in 1957 including bobby pins, tranquilizers, cigarettes, and even an unpaid parking ticket. The original car key to Miss Belvedere. A microfilm which contains 812 contestant entries, the winner of which would win Miss Belvedere. 10 gallons of leaded gasoline just in case if gasoline was no longer used or available as a fuel in 2007. 5 quarts of oil to fill the engine upon unearthing in 2007. A Douglas Aircraft Co. aerial map of airport facilities and legend. A message from the Tulsa council of Churches with a prayer for "the greatest good" for the next 50 years. A book, "History of Churches in Tulsa" and a directory of all the present churches. Statement from the Board of Education with historical data related to 50 years of education in Tulsa. Several copies of the printed issue "School Life" all-high school publication by Tulsa high schools. A message from the then in office Mayor and Chamber of Commerce officials. 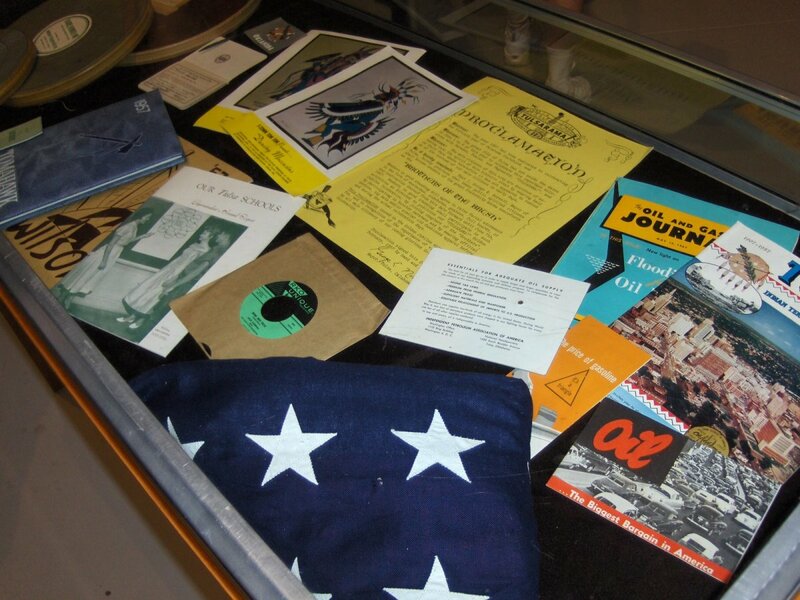 48 star American Flag and Oklahoma state flag which had been flown over the national capitol and state capitol. Aerial photos of Tulsa and surrounding areas. Messages from all living former mayors of the city - their record of service and civic accomplishments in the city, state and nationally. Paper copies of the 812 contestant entries. The lucky winner of the car would also win a savings account, opened on the day the car was buried. Originally $100.00, with 50 years of interest included equaled a whopping $700.00 in 2007. Since the car was buried during the height of the Cold War with the Soviet Union, the vault which contained her was built out of reenforced concrete, capable of withstanding a nuclear bomb. 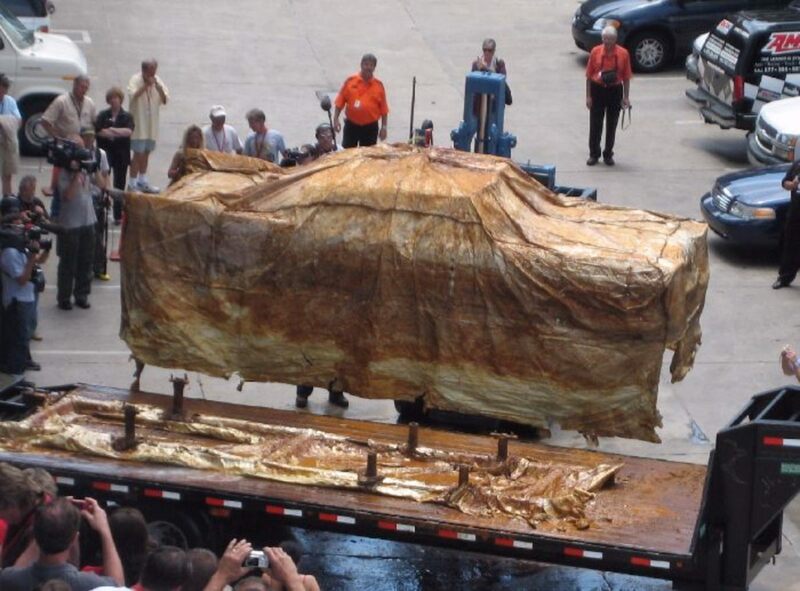 With great fanfare, the shrink wrapped car was lowered into its tomb, the air pumped out, six inch thick concrete slabs were lowered on top, followed by more than two feet of dirt, thus sealing the car in what was believed to be an impervious crypt of invincibility. The plaque that sat above Miss Belvedere's burial spot for 50 years. Aura and mystique surrounded the car as she sat underground as local residents were well aware of the eventual date in which the car would be opened. As the year 2007 neared, Belvedere Fever began to spread throughout the city, state and even the country. A website was set up, BuriedCar.com, just for Miss Belvedere's fans which included photos and message forums. The unearthing was going to be the biggest event that ever hit the city. Planning for it began years in advance. Miss Belvedere's very own website! Vintage 1990s. 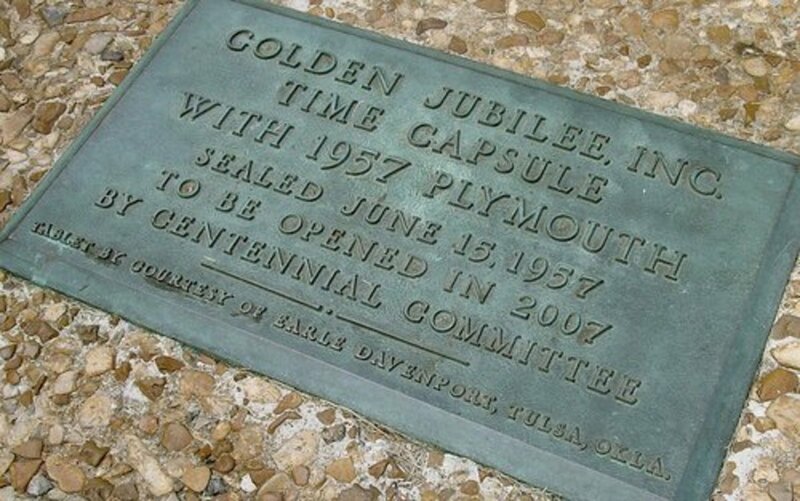 A full 18 months before the anticipated opening of the vault preparations began, Tulsa Residents were lining up to volunteer in any capacity to be a part of what was indeed a historical event. Lead by a now adult Sharon Davis, business woman, and Don Walker, a Tulsa bank executive. The street alongside the site closed, the grass and dirt dug away to reveal the concrete vault. The internet easily buzzed with search after search of Miss Belvedere. People poured in from all around to gaze at the work the volunteers had done to the site. Bloggers were having the time of their lives. 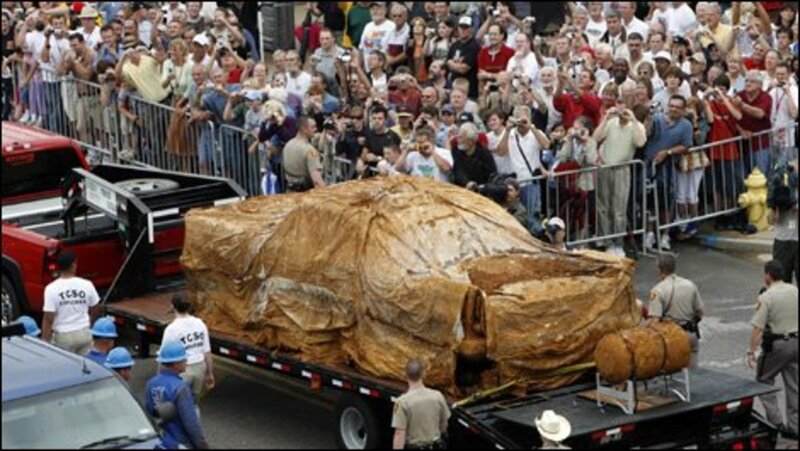 For how often does one hear of a car exhumation? Workers begin excavating the courthouse lawn where Miss Belvedere was buried for 50 years. With only weeks remaining, workers need to open just a part of the vault ceiling in order to inspect the vehicle for exhumation. As eager, excited on lookers gazed down at them, works pealed back the last of the dirt and rock and opened the first slab of concrete. The sunlight pierced the vault for the first time in 50 years illuminating the sad sight inside. Still covered in her supposed waterproof plastic wrap, Miss Belvedere lay half submerged in a pool of nasty stagnate water. Her concrete vault, designed to survive nuclear destruction, simply wasn't designed to be waterproof. Talk about an oversight! 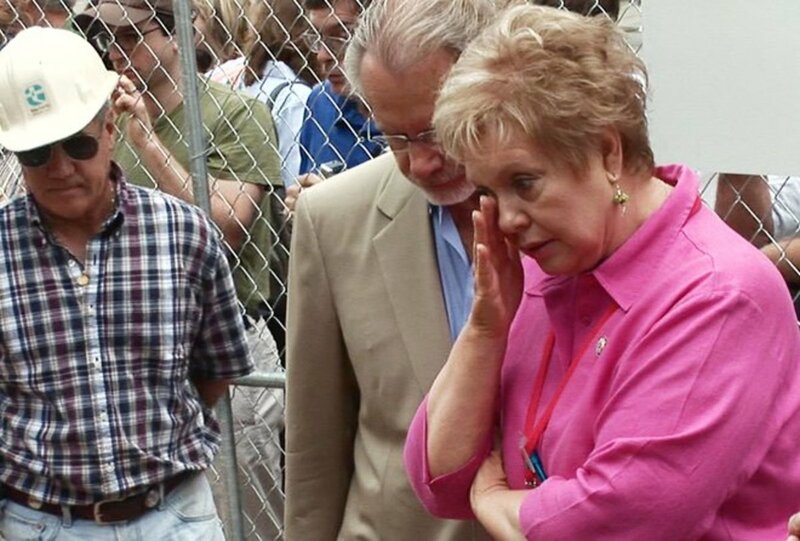 During excavation, Sharon Davis can't contain her sadness over Miss Belvedere's poor state. Works pump out the nasty water from the waterlogged vault. 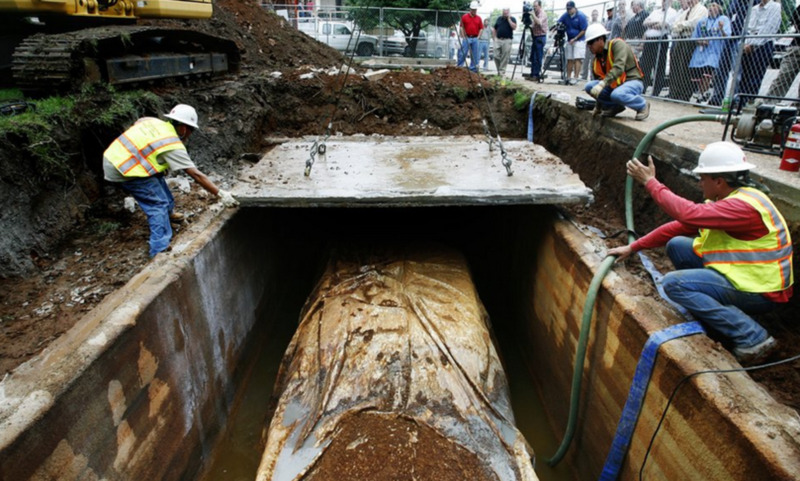 Further inspection by the workers confirmed that groundwater had filled the vault at least several times, completely submerging Miss Belvedere. 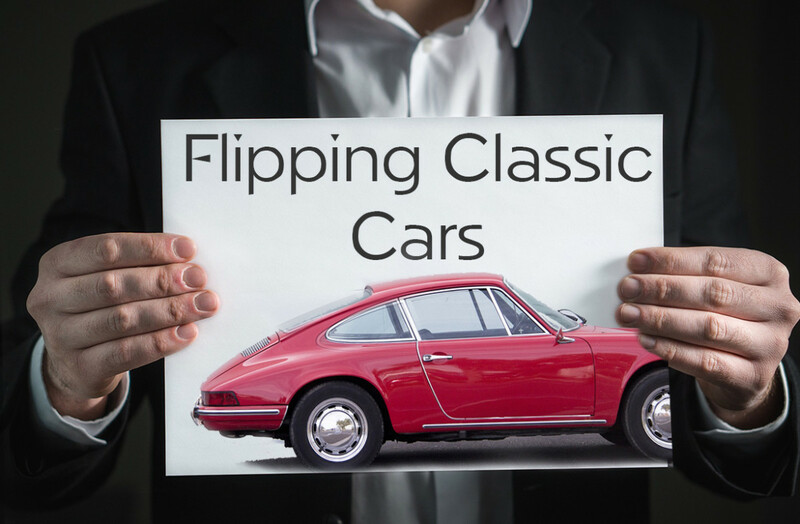 Plastic wrap or not, there was little hope for a drivable car. She now had more in common with the Titanic than that of a time capsule. 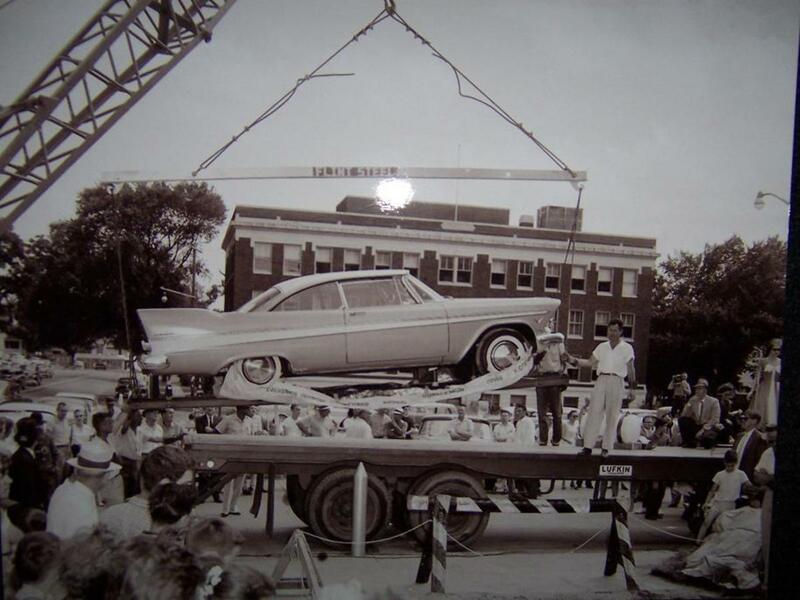 Excitement still filled the air as a crane lifts the car onto a flatbed truck. Hundreds of people watch as Miss Belvedere begins her final journey to the Tulsa Convention Center for unveiling. As hundreds of people watch, Miss Belvedere is lifted out of her watery tomb still covered in its "waterproof" plastic cover. Miss Belvedere on the way to the convention center. Note: The drum time capsule with all the artifacts behind the car on the trailer. Almost 9,000 people packed into the Tulsa Convention Center to witness the historic, somewhat heartbreaking unveiling of Miss Belvedere. Pulling the rotting plastic wrap away revealed the true state of the car, a heartbreaking rusted pile of metal. 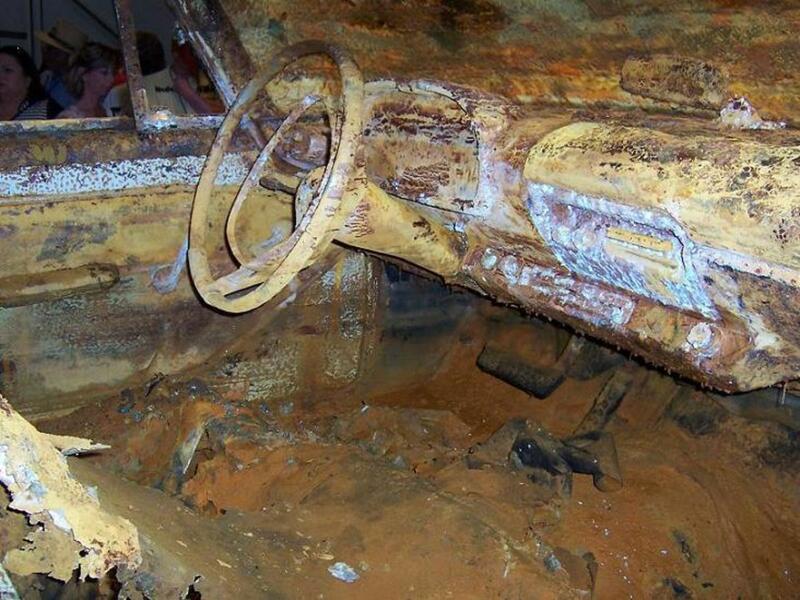 A thick coat of rust covered every square inch of the car, inside and out. 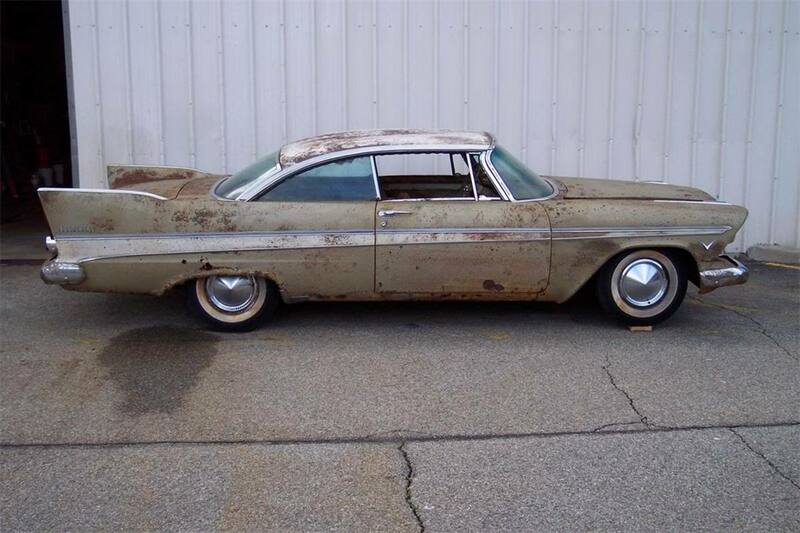 The interior had completely rotted away, the engine rusted solid with no hope of ever starting again. The microfilm of the ballet entries was nowhere to be found, disintegrated. In the glove box, the women's purse an unrecognizable lump of soggy goo. Some items survived. Also missing was the car's key, having been made from aluminum, it too likely disintegrated. 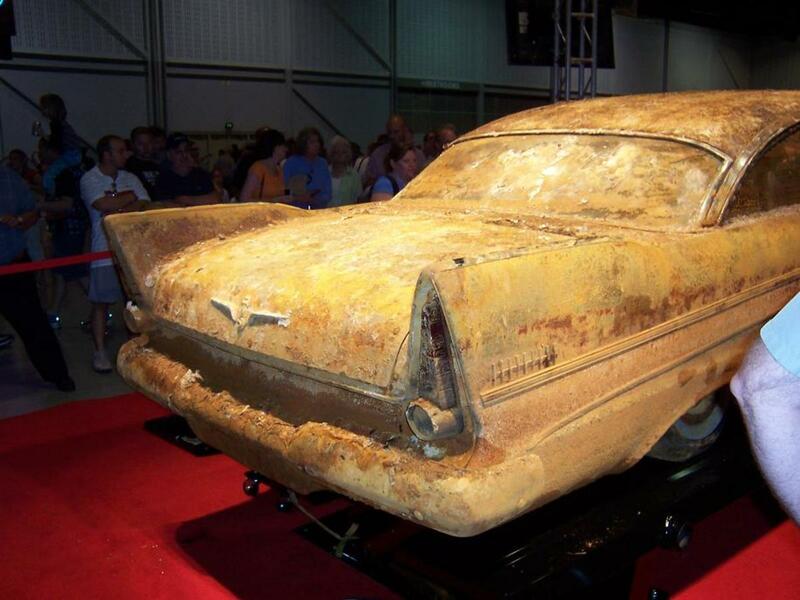 The sealed time capsule buried with the car, in fact, protected its contents perfectly. Untouched by either rust or decay, the folded American flag and stacks of letters looked as vibrant as the day they were sealed. 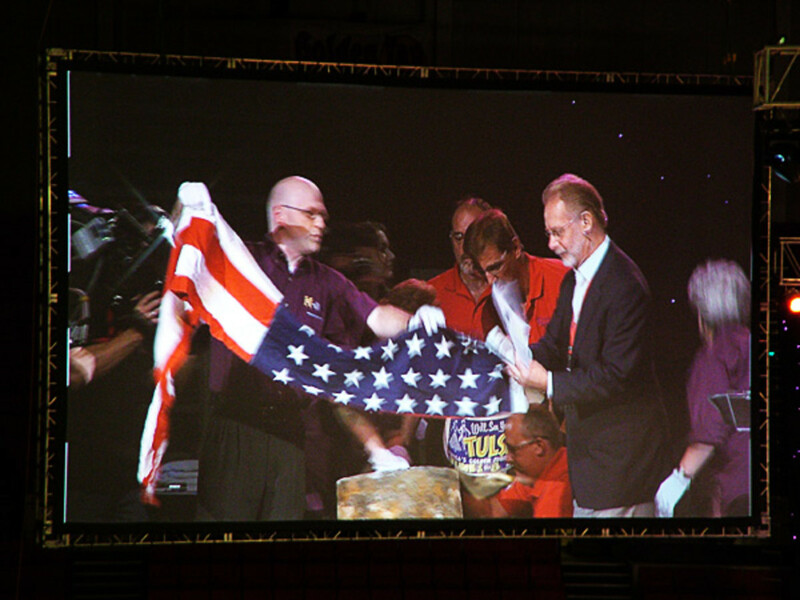 The 48 Star American Flag was one of the few items that were not destroyed by water and time. Miss Belvedere at her unveiling. 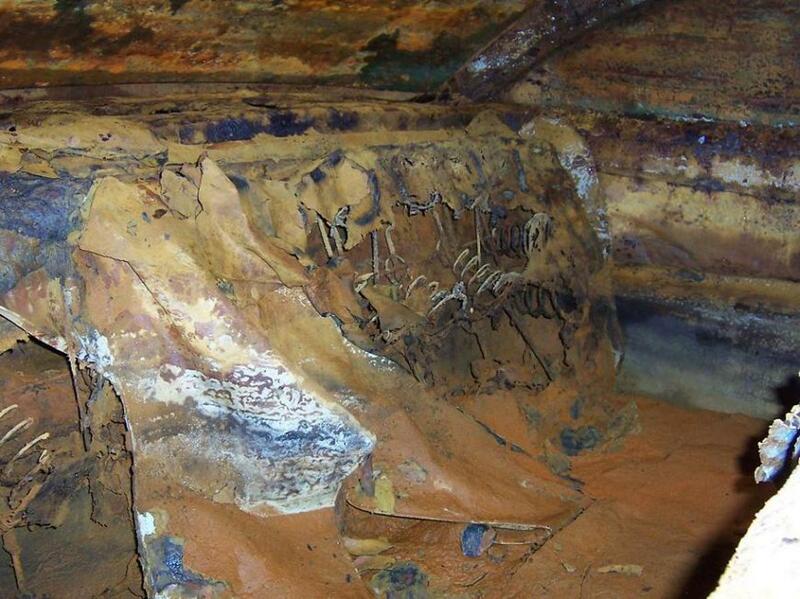 An inspection of the Belvedere revealed that the superstructure and suspension had completely rusted away. The rear springs were broken and the frame so fragile that it could barely hold its own weight. The rear seat of the car. Notice that the seats have completely rotted away. The contents of the woman's purse. Un-starred items did not survive the water logging. 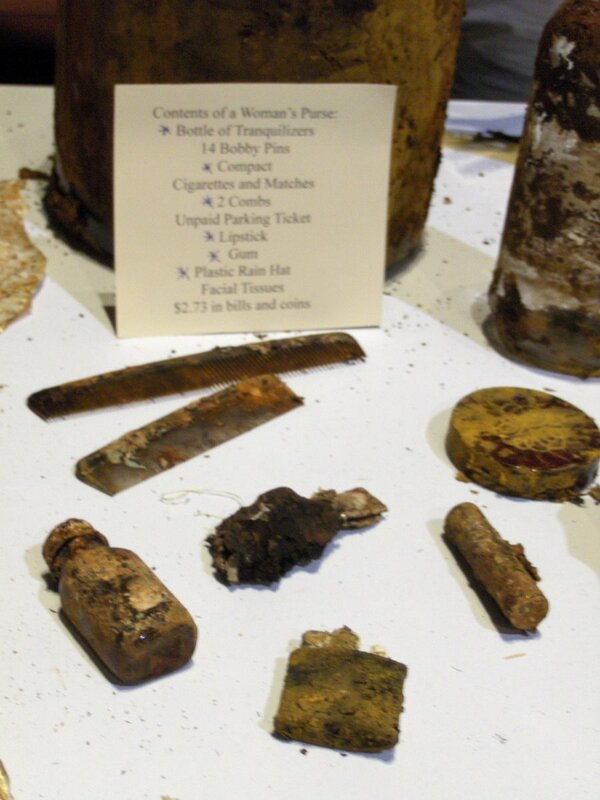 The items inside the cylinder capsule were perfectly preserved! The rusty cans of beer. If you remember, the lucky person who guessed what Tulsa's population would be in 2007 wins the car! Sounds great in concept and even on paper, but lets throw a wrench into it. Raymond Humbertson guessed the closest to Tulsa's actual population. The problem is he passed away in 1979. Ok fine, the car will then go to his widow right? Sorry, she passed away in 1988. Ok, did they have kids? Sadly, no. So now what? Well, the prize officially passes to the siblings of the winner, three to be exact; Raymond Humbertson's 100 year old sister Catherine, her nephew Robert Carney and his sister M.C. Kesner. Congratulations! Signing the title over ended the City of Tulsa's obligation to the vehicle and its condition. The winners of Miss Belvedere. Are you surprised Miss Belvedere rusted away? If there was one thing apparent amongst Miss Belvedere's new owners, the car needed restoration and clean up. The problem is the damage to the car is so complete. 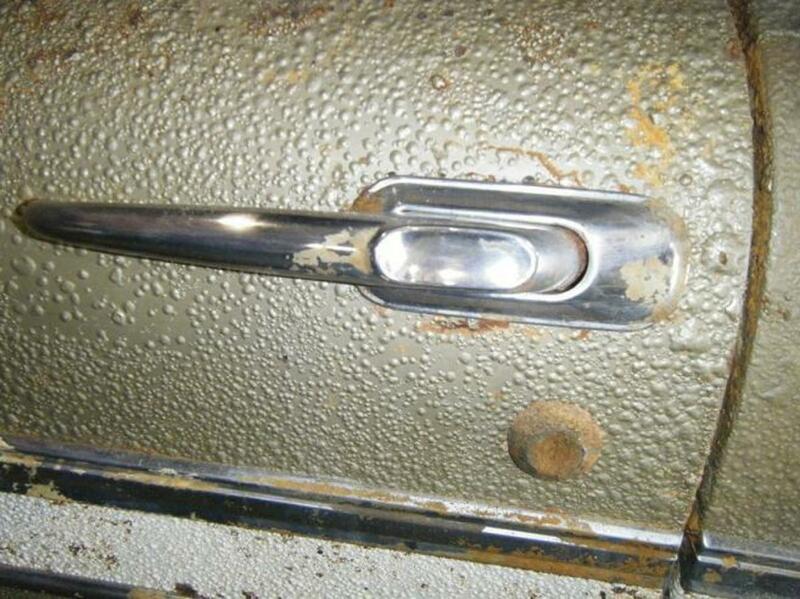 Enough pressure could easily send one's finger thru the 1/4 inch quarter-panel steel. 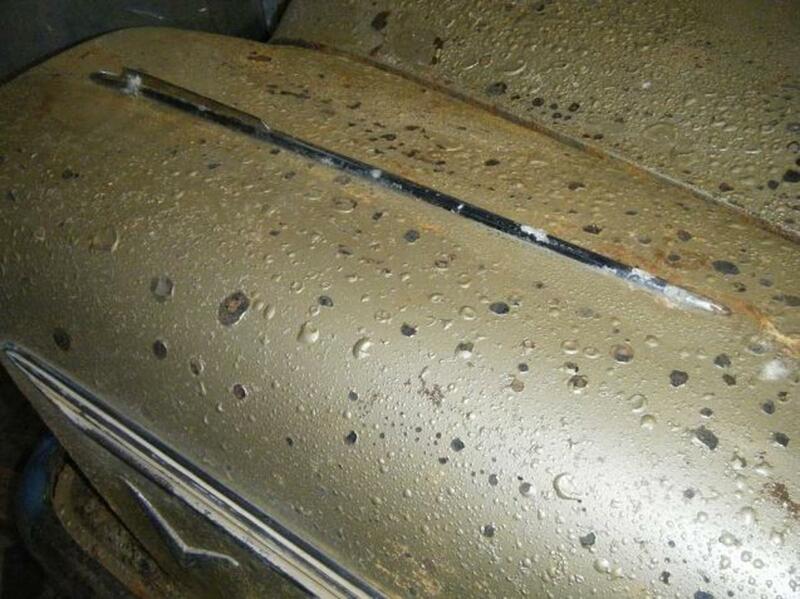 Not to mention the decades worth of rust that covered every square inch inside and out. Ultra One, a company specializing in high quality rust removal products approached the owners of the wayward Plymouth with an offer to de-rust and stabilize the car. With the owners' blessings, she was moved to their facilities. 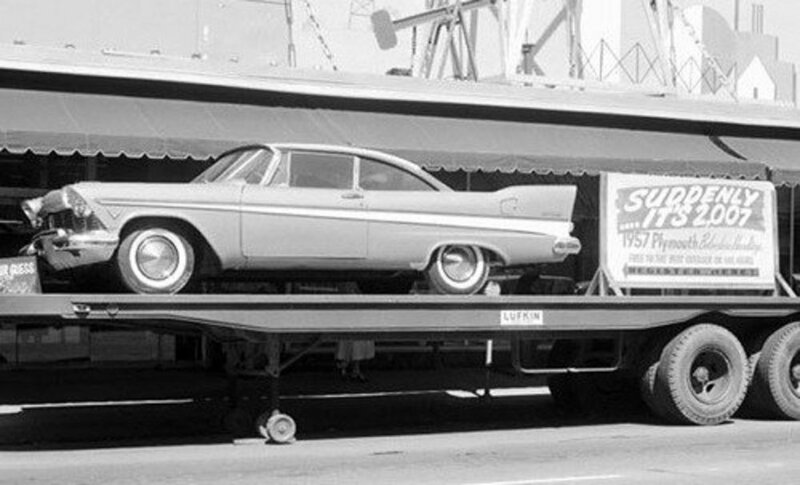 They planned to stabilize the car enough to turn it over to a restoration place. Enthusiasm ran high as Miss Belvedere's preservation began with hopes of a running engine and working headlights headlined the owners' plans. Miss Belvedere upon arrival at Ultra One. The quintessential 'Before' picture. De rusting on the right fender looks promising. Preliminary test results yielded remarkable results. Using their's Safest Rust Remover, Ultra One tested various components in and around the car, a quarter panel, dash, value covers among other parts. Each showed significant rust removal. A donor Belvedere was secured to rebuild the undercarriage and framework. Plans were outlined to pull the motor and rebuild it. Optimism was high. Miss Belvedere since 2010. The red Belvedere behind her is the donor car. As the first decade of the 21st Century came to a close, the most notorious Belvedere in the world fell into complete obscurity. The new decade brought little news. 2010 came and went. As did 2011. Nothing. The New York Times decided to look into Miss Belvedere's current status. 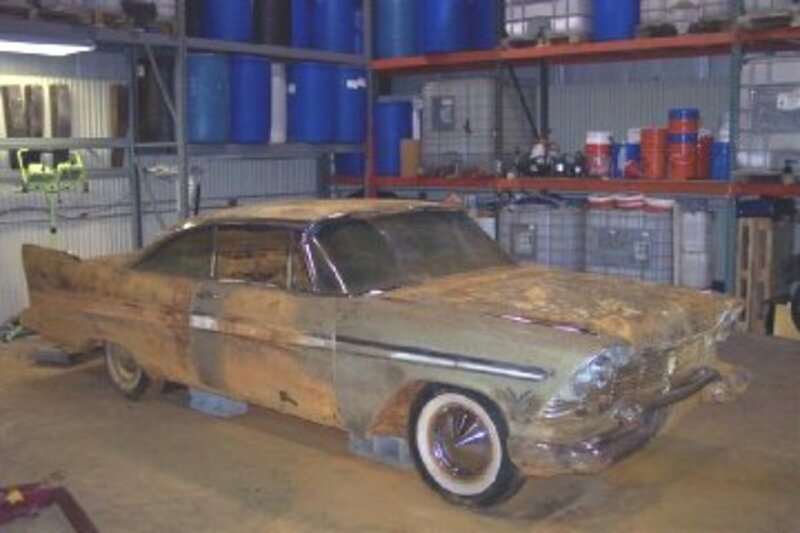 Sure enough, they found the infamous Plymouth buried deep in the back of one of Ultra One's warehouses. Forgotten. Miss Belvedere's condition since 2009. The best 'After' picture we will ever see of her. Ultra One sank $20,000 into Miss Belvedere's de-rusting process and once it was complete, her restoration ground to a halt. At first glance, her condition could be considered pretty remarkable. She looked far better than the day she was unveiled. Her chrome glinted once again, her windows transparent. It's not until you get up close to her, that the reasons for her halted restoration becomes apparent. The chrome appears to have fared better than the painted surfaces of the car. The paint has bubbled after years of being underwater. 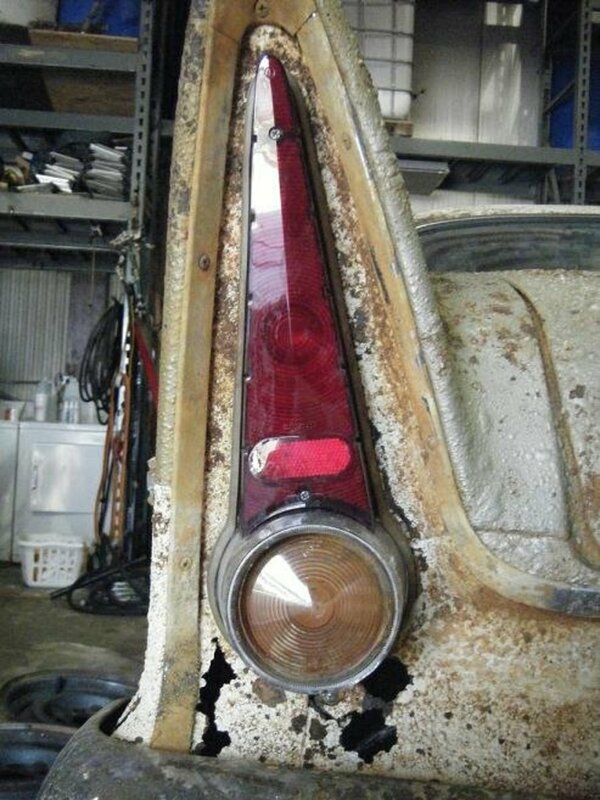 The tail fins show that rust has completely eaten through the sheet metal. 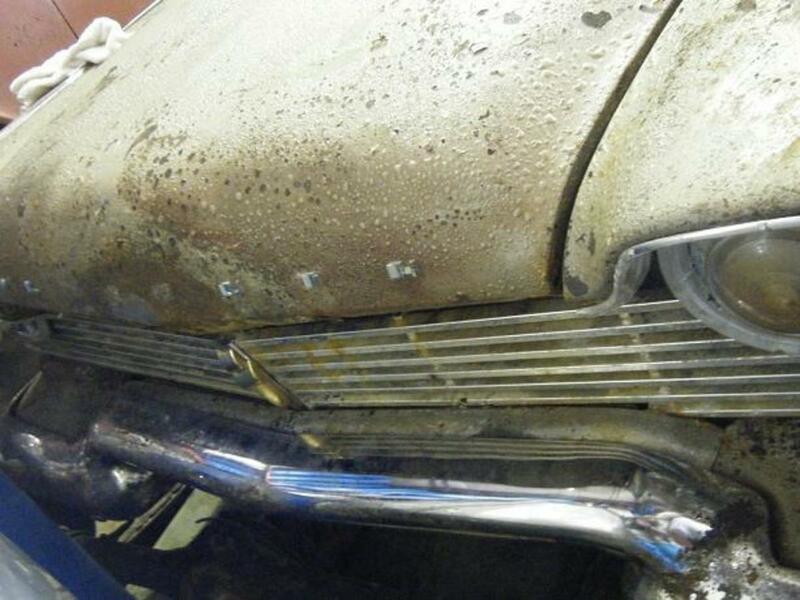 An up close inspection reveals the hopelessness of a full restoration. While the paint had been de-rusted, much of it had bubbled and pealed. The engine had such a build up of silt in it, that it rendered it impossible to rebuild. No attempt had been made to restore the interior. With the exception of the dash, much of it still looked as it did in 2007. Turns out, much of the mud inside the car is actually what's still holding it together. 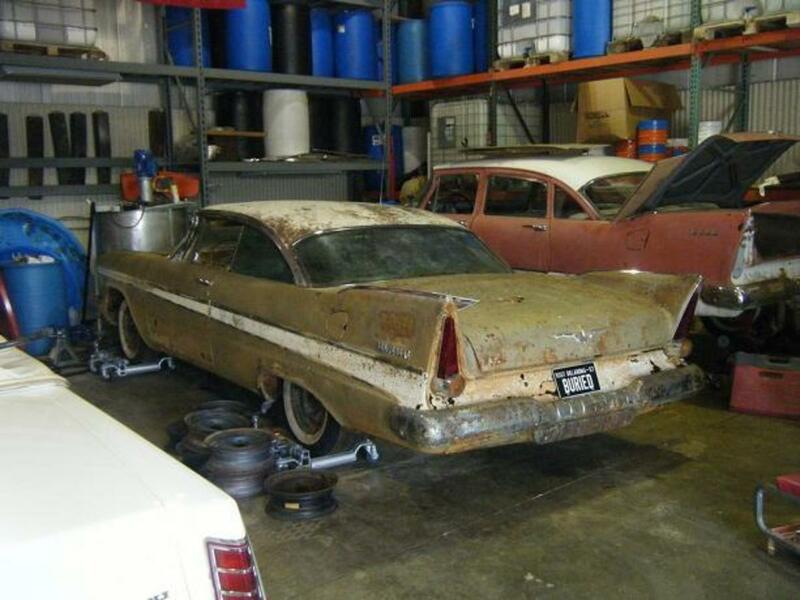 Abandoned were the plans to restore the car to running condition. While the leaf springs were replaced to correct the dropped rear end, the body was too brittle to replace the frame. 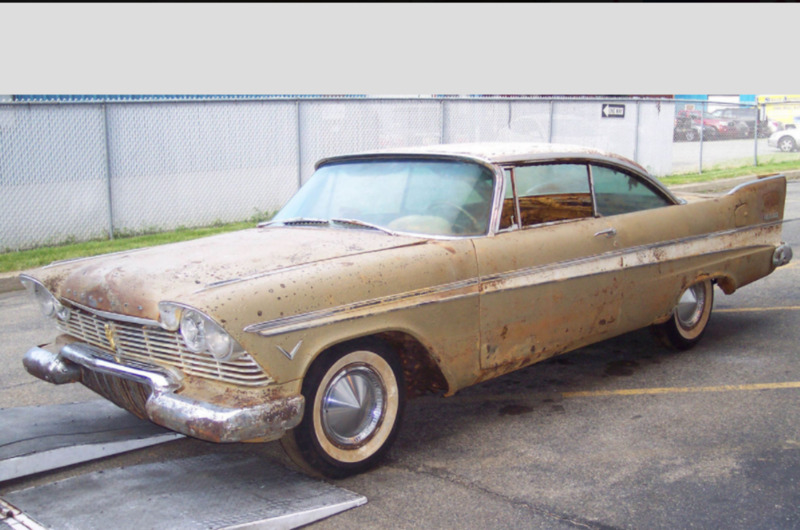 Foster now describes the car as "more rust than bucket". 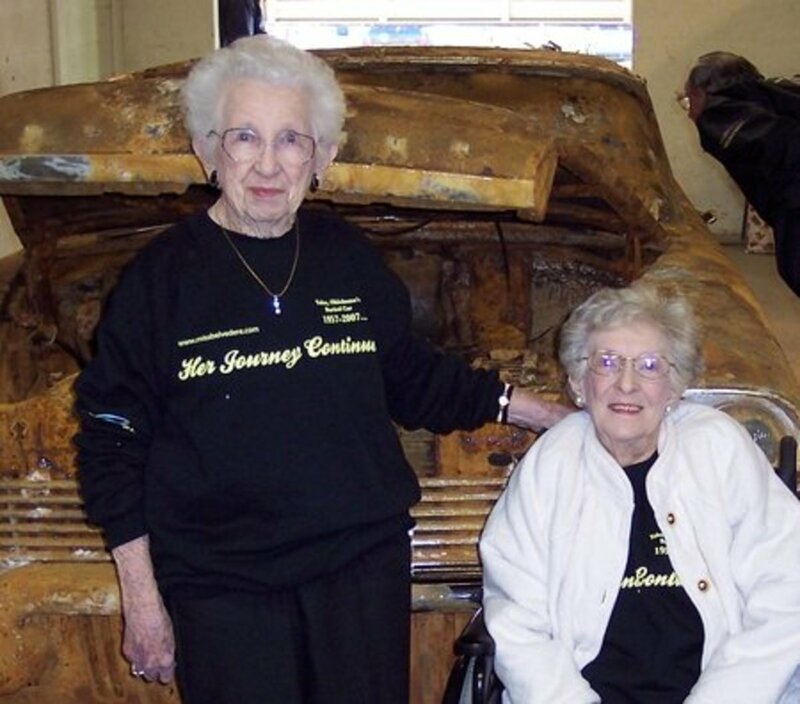 The owners and Ultra One have since attempted to donate the car to a museum for static display. 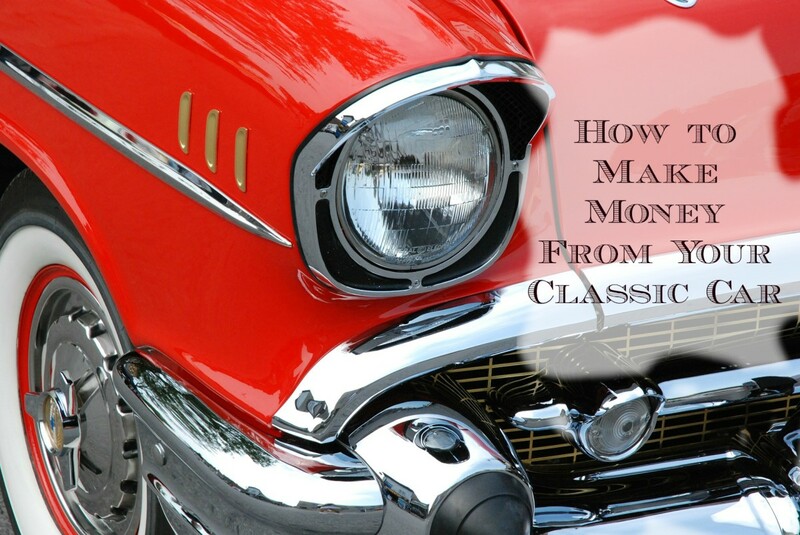 As a piece of 1950s Americana, its historical value is without question but the poor state of the car has left many turning a deaf ear. The City of Tulsa rejected the idea of displaying it, no doubt eager to distant itself from disappointing press the car brought to the city in 2007. 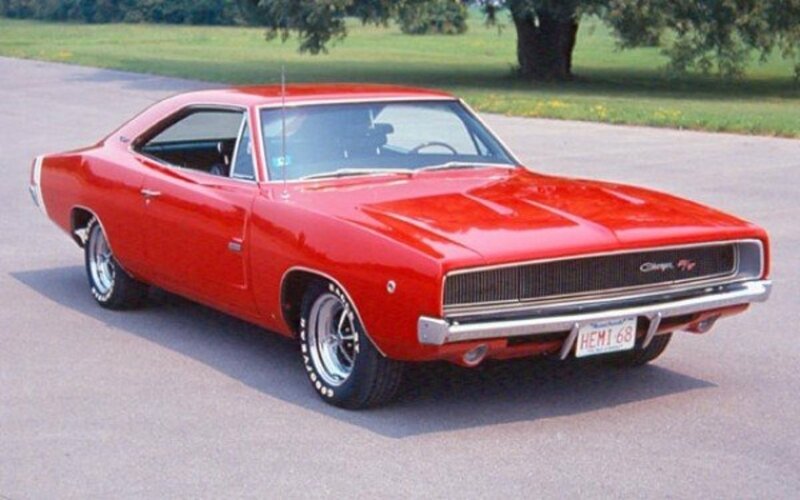 The Smithsonian Institute also declined to accept the car stating that it was not "America's garage". Seven years of exile finally end with some exciting news for dear Miss Belvedere. 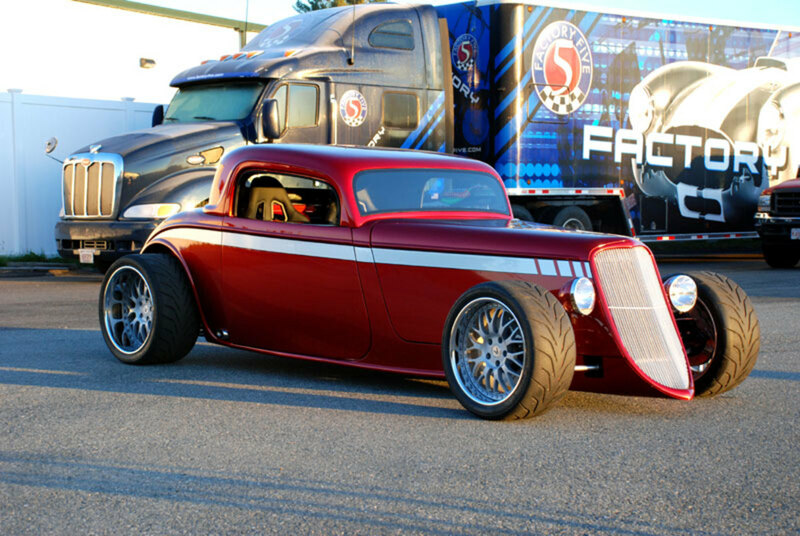 In June 2015, Dwight Foster finally secured a new home for the rusty old car. Historic Auto Attractions Museum of Illinois has agreed to give Miss Belvedere a permanent home amongst its 75 car collection. In summer 2017, the car was loaded into semi for transport to Illinois. The exhibit is set to open in 2018. While it may not have been the fantasy ending to her journey many had hoped for, at least the car will live on for generations. 2048 - The Other Buried Plymouth. 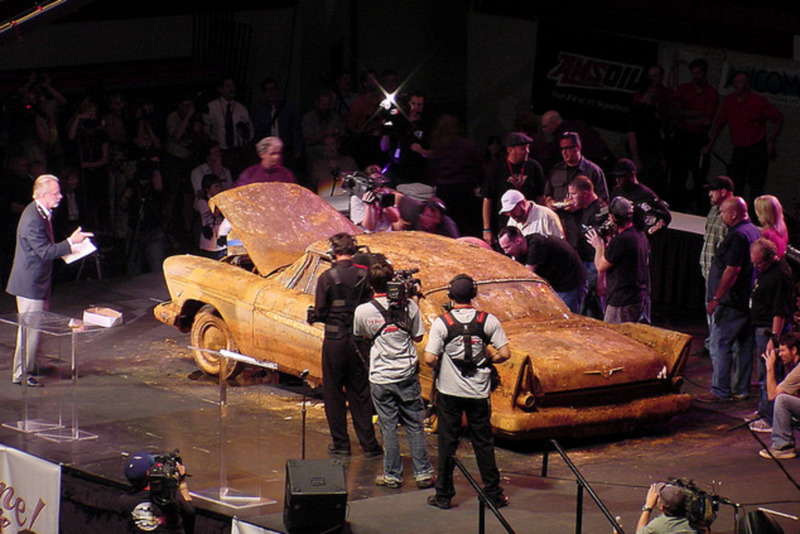 The City of Tulsa just can get enough of burying Plymouths. 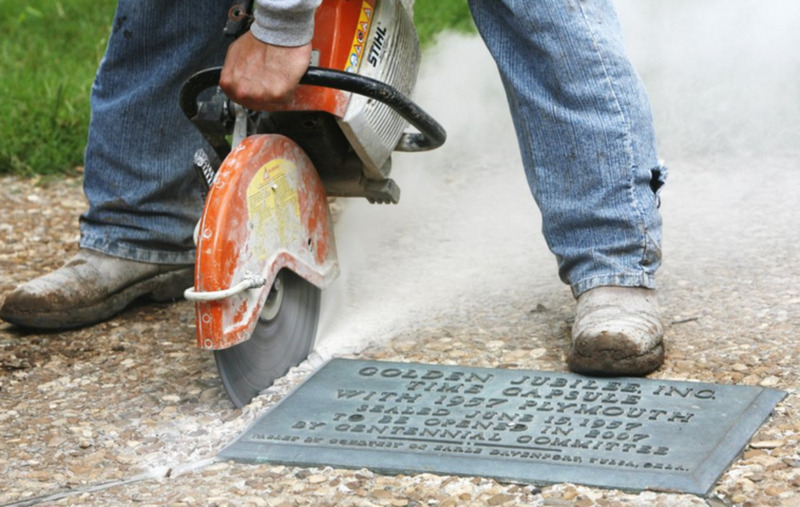 Meet the Prowler, interred into the ground as part of the city's centennial. 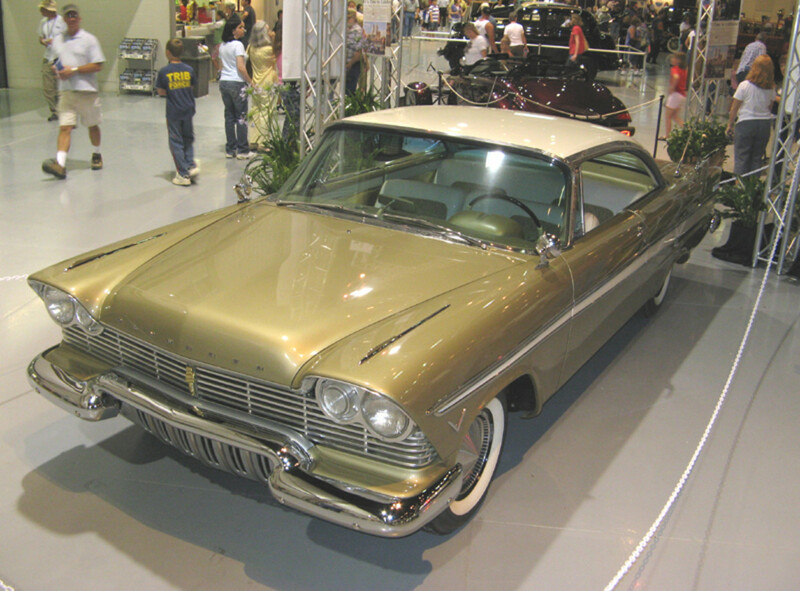 Interred in 1998, a full ten years before the unveiling of Miss Belvedere, this $300,000 prototype is of one of the last Plymouths ever made. It will remain in its crypt until 2048. There is one key difference between the two. 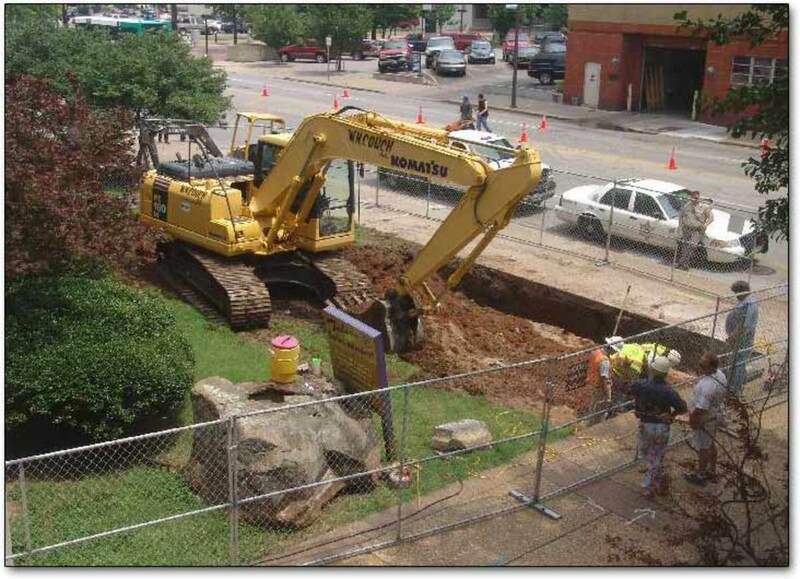 The Prowler has been buried in an above ground vault. Someone realized that putting a car underground probably isn't the best idea. So how will this car look in fifty years? I guess we will find out in 2048! The Prowler's above ground vault. Could-a should-a would-a...The fact remains that this is what it is. I say make an attempt at saving what is there (Which isn't much) and build the car as it was in 1957, as we would want to see it today, using whatever is useful or a reasonable facsimile I like the donor car idea and they should build the rebuilt car around that frame and use whatever they have now to recreate the car as they would have hoped it would look like today. In addition, I would take the rusted pieces and get a plexiglass box-like you would display a baseball or hockey puck & seel them as they did in San Fran when they redid the Cable Cars & the Golden Gate Bridge selling the old bolts from the bridge & the pieces of cable from the old cables they replaced when they did the restoration of this project in the 1980s. Raise money with the restoration and pay for the restoration with the proceeds from this souvenir program. No need to thank me, I'm a 37-year marketing guy for AT&T now retired. Shame on Oklahoma leaving this family a rusted out hulk they could really do nothing with, it should have been fixed or replaced by the city that buried it. Horrible that this city just gave away this car like this. It must have been an awful let down for the family that won it. Just shame on Tulsa, Oklahoma. Should have built an above ground Building sealed off from the elements. 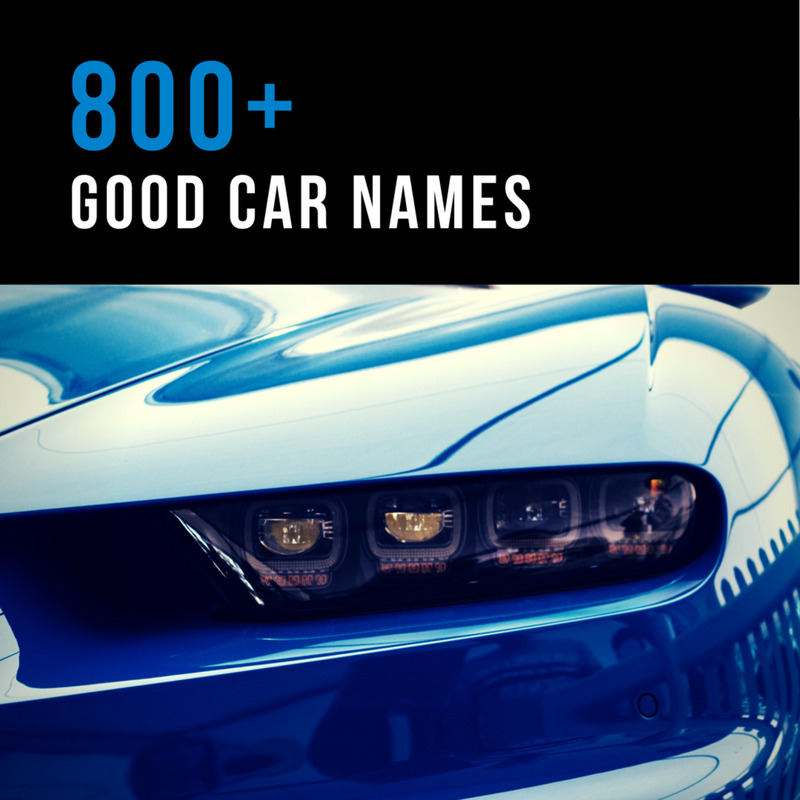 There have been many Vehicles found sealed off in Brick Buildings with Great success. They should have put it in a wooden box and coated the out side with hot tar, then wrapped the box in sheets of plastic and sprayed each layer with hot tar, that works because my grandfather did it with a lunch box to see if it would work when he was a kid, he put some of his toys in it and they were perfect 68 years later, it was a pain to get open. 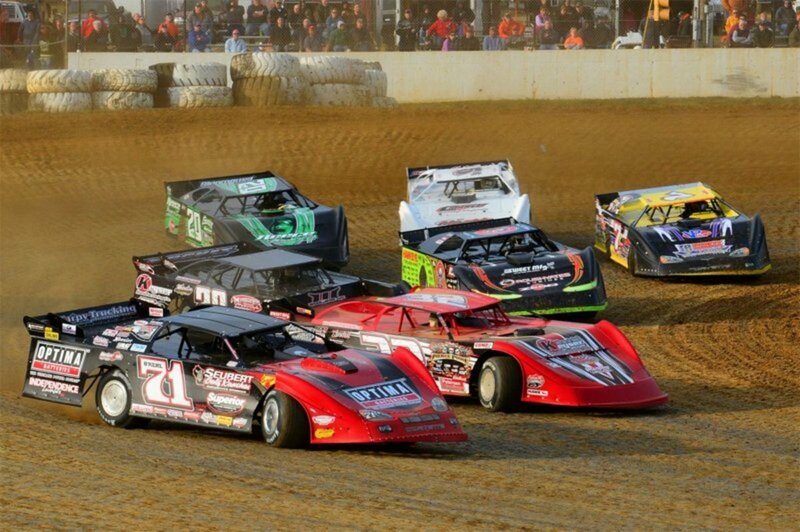 Soulda buried all those ugly cars. 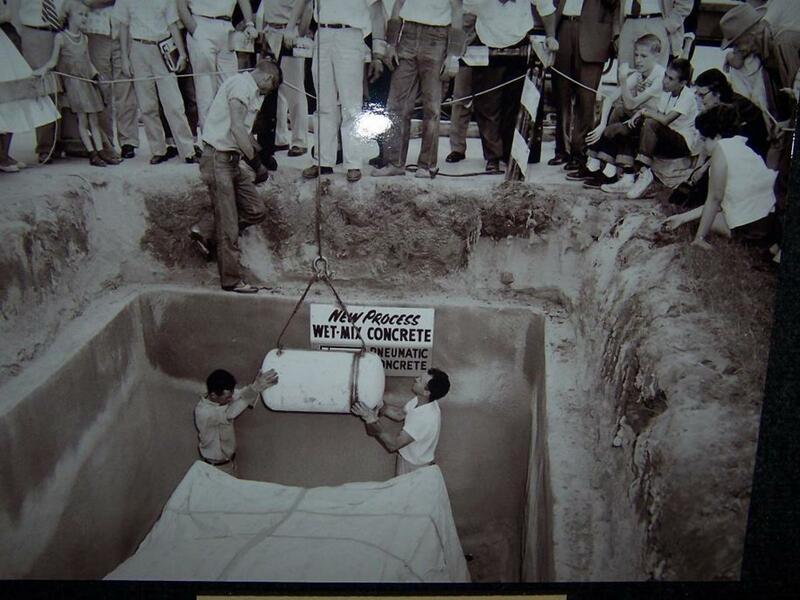 Burying Miss Belvedere was an ill planned and informed project from the beginning. Ask anyone familiar with dis-interments at cemeteries what they find. This unfortunate car would have been far better off if taken to someone's home garage and locked away with no sunlight on it for all those years. Now, what we have is a Plymouth with only 4 miles on the odometer that is not even a suitable donor for another car's restoration. A total waste of a good car. How sad that the water did such damage. It would have been so exciting if she came out in her original condition.